There's a bit of change underway on the Now And Zin Wine Blog. If all my tech-savvy know-how falls into place without a hitch, you might not even notice it, except to remark that it may well be the first time all my tech-savvy know-how fell into place without a hitch. For a number of reasons, I'm exiting the blog platform I have used for the past two years or so. Website Tonight's Quick Blogcast service has looked good, but it has provided me with several technical issues I felt I needed to address. I'm in the process of a "soft opening" of the new site, Now And Zin Wine, which should become official over the weekend. It's actually a return to Google's Blogger platform, which I used in the initial months of this effort. Google made a lot of upgrades since I had used it last, and it made sense for me to return to it. If all goes well, it should be a seamless changeover. If, however, you have saved links to articles on the Now And Zin Wine Blog for any reason, they will disappear at some point. All the articles which have appeared in the past two years have been shifted over to the new site, so if you need to fix any links, they are available. The Now And Zin Wine Report podcast also has a new location, and it is accessible through Now And Zin Wine. You'll also find links for the Wine Country series, Blood Of The Vines, the Now And Zin Facebook page, California wine events and other items on the site. The search box is easy to use, and the share and subscribe features should also be painless. I'd love to hear feedback on the new site, if you feel inclined. Contact information is available on the "About Randy Fuller" page at Now And Zin Wine. Just click on my picture. Thanks for all your support during an amazing growth period for Now And Zin. I hope you find the changes make the site better. The Rock And Roll Hall of Fame will induct new members on April 14, 2012 in Cleveland, Ohio. It's the 27th annual induction ceremony, the 27th time rock fans get to yell "It's about time!" or "Where's KISS?" With all that shouting, we're going to need something to soothe our nerves. With that in mind, let's take a look at the 2012 inductees and pair a wine with each. Our pals over at the excellent rock music blog 30 Days Out have had this post up for a while now, with some tasty pics and music attached. If you're singing along with “(You Gotta) Fight For Your Right (To Party! )” it's a good bet you're doing jello shots or drinking beer from a glass with quarters at the bottom. The Beastie Boys' blend of funky rock, rap and hip hop need not be reserved for the lesser beverages. In fact, Beastie Mike D has dabbled a bit at wine criticism. Not surprisingly, he likes wine with a bit of funk. Root around a bit in the Côtes du Rhône aisle and pop for a Châteauneuf-du-Pape. You should be able to find a wine that brings enough funk to get a party started without fisticuffs. Donovan's music is poetry, a delicate flower at one turn, a handful of psychedelics at the next. His lyrics abound with references to wine, including a lovefest for the "maroon-coloured wine from the vineyards of Charlemagne." Sounds like a Burgundy is about to be opened. Bonneau du Martray should do nicely, from the Corton-Charlemagne Grand Cru. You may want to select a white wine, as Charlemagne's wife is said to have preferred her royal hubby not mess his beard with the red stuff. You are probably a much neater drinker than Charlemagne, though. In the mid-1980s, when Guns N' Roses exploded from L.A. with a balls-out Sunset Strip strut and an Appetite For Destruction, they redecorated a rock and roll landscape that had become rather tired and listless. G 'N' R offered up a brashness which made other acts seem like they were mailing it in. You may be tempted to go with a beer for them - a cheap one, in a bottle you can hurl at something - but California has a wine worthy of the Guns N' Roses brand of excess in old vine Zinfandel. Both winemaker Joel Peterson and his Ravenswood Lodi Old Vine Zinfandel are brash enough for rock and roll. If any one of these inductees screamed for a wine pairing, it would have to be Laura Nyro. It was, after all, she who suggested we go "down by the grapevine, drink my daddy's wine." She also suggested "there'll be lots of time and wine," but, sadly, her time ran out. Lift a toast to her with Schramsberg's 2008 Brut Rosé. It's complex and dry and will fit with anything you bring to a Stoned Soul Picnic. BloodSugarSexMagik would be a good name for a wine, if the Red Hot Chili Peppers hadn't already claimed it as their own. Their funky guitar rock and throbbing sexuality certainly puts one in the mood for a glass of something nice to pair with their spicy gastronominal moniker. Chili peppers call for something a little on the sweet side, like a nice Spätlese Riesling. Dr. Loosen' Mosel-Saar-Ruwer efforts in that vein should provide enough ripe fruit sweetness to offset the power of the pepper. This dual-identity entry is remembered more for their hard-rocking, hard-living '70s style than their mod '60s diminutive version. Rough and rowdy, never afraid to let the rough edges show, The Faces have Tannat written all over them. Choose a varietal selection from Madiran for that swagger, or pick one blended with Cabernet Sauvignon to dress up the palate like a skinny tie on a sharkskin suit. The electric blues master known as the Texas Cannonball, Freddie King left his fingerprints all over rock and roll. He was a huge influence on anybody who ever picked up a guitar and intended to do some damage with it. So affected by his entire persona, Grand Funk shouted him out in one of their big hits. Mr. King deserves a vintage Port, full-bodied and luscious, with a whiff of smoke to reference the dance halls and pool rooms of Texas, where the blues is still the king. The Ahmet Ertegun Award goes to the late Don Kirshner, a songwriter and song seller who played a big part in shaping the pop music side of rock and pioneered the maturation of televised rock concerts. For good or for bad, he was the creative fire in the hole for The Monkees and The Archies. Kirshner's wine should be a commercial success - natch - and should carry its years well. Mouton Cadet is a best-seller from Bordeaux, so you can expect good things from it with age. It's easy on the pocketbook, too. A bottle of the current vintage will probably set you back less than a Monkees Greatest Hits CD. You might not recognize his name, but Cosimo Matassa's New Orleans recording studio was the place from which many great rock hits of the '50s burst forth. Matassa eschewed gimmicks and audio manipulation, preferring to let the music speak for itself. The winemaking hasn't changed much at Lopez de Heredia since the 1800s - they didn't like gimmicks and manipulation then, and they still don't. Their 1991 Viña Tondonia Tinto Gran Reserva is pure Rioja elegance. As a scientist, Tom Dowd worked on the Manhattan Project that gave us the atom bomb. As a recording engineer, he worked at the Atlantic Records console and gave us Ray Charles, Aretha Franklin, Eric Clapton and the Allman Brothers. Both sides of his career packed a whallop. Would a fruit bomb be out of place here? How about a warm-climate Syrah with plenty of depth under all that fruit? Andrew Murray's 2008 McGinley Vinyard Syrah comes from the hot microclimate of Santa Barbara County's Happy Canyon - and it is the bomb. British recording engineer and producer Glyn Johns helped nuance storm out of the speakers with acts as diverse as Led Zeppelin, The Eagles, Joan Armatrading and The Who. He could coax a heartfelt ballad out of the recording session as well as bring the thunder and lightning right through those gold-plated wires. Merlot here, with a silky, mellow side playing counterpoint to the rock and roll smoke and leather notes. This article ran originally on the excellent music site 30 Days Out. with Now And Zin Wine and Trailers From Hell. The movie is "Alien," and that drippy, gelatinous monster with the big teeth scares the wine right out of you. How do you think Ripley felt when the alien got right in her face? She probably felt relieved it wasn't right on her face. That scenario didn't work out too well for her spacemates. This alien scared so many people there should have been a red threat level attached to it. Personally, I was off eggs for months after I saw the film. The alien costume was so well done, the "guy-in-a-suit" tag really doesn't apply, even though it was a guy in a suit - a drippy, gelatinous suit. The Creature from the Black Lagoon didn't scare me half as much as ol' drip tooth. The Creature could have used a foot-long fang to boost his scare factor. British Columbia's Monster Vineyards has Merlot and a red blend called Red Eye. Maybe the White Knuckle would be more appropriate in case the monster has a taste for fish. Little A'Le'Inn Wine - Directly from the heart of Area 51 - at least I presume that's where Rachel, Nevada is located. It probably pairs well with that Alien beef jerky from Baker. Alien Wine Festival - Pecos Flavors Winery in Roswell, New Mexico, was the host of the first ever Alien Wine Festival in 2011. Information for the 2012 event is mysteriously missing. Maybe we need Agents Scully and Fox to look into this. Or, maybe they were the only ones to show up last year. Alien Wine - An article by fantasy writer Raymond E. Feist on exploring the alien world of wine. Alien Wine - This recipe for homemade hibiscus flower liquer is untried and untested - by me, anyway - but it sure looks easy. Let us know how it works out for you. I'm not a big fan of lager beers, but this one actually tasted pretty good with Thai food. 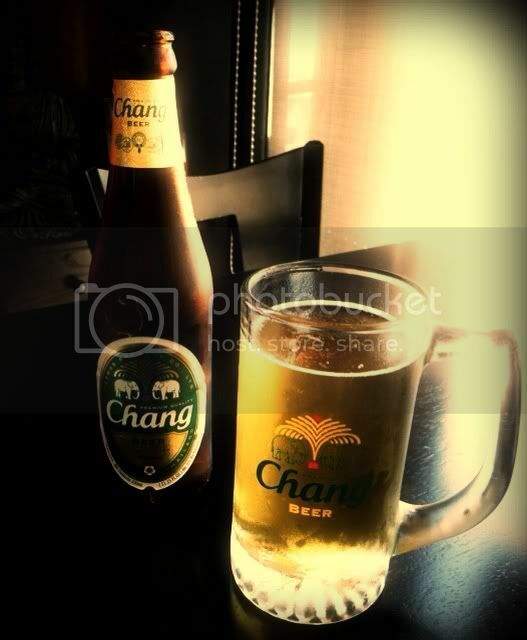 It's a Thai beer called Chang. The brand was established in the mid 1990s and became something of an overnight success in Thailand. They now hold a 50% market share there as the leading beer in the country. The name means "elephant" in Thai, and plenty of them adorn the label of the bottle. Elephants are revered in Thailand, and the brewery no doubt hoped the association with them would elevate the product. Apparently, it worked. It's something like an American beer company branding themselves with the Bald Eagle - but who would be crass enough to do that? Chang is a nice golden color in the glass and the aromas remind me of wine - Sauvignon Blanc, specifically. There is not much of a head to speak of, and what's there dissipates rather quickly. The nose shows a smoky side along with a floral aspect and some citrus zing. On the palate it's full and refreshing, with a nutty salinity to counter the slight hoppiness. On the finish there's a slightly bitter aftertaste. The beer paired quite well with my garlic pork, and even the salad beforehand. Did I mention the Chang was a $1.99 lunch special? That's a hard price to beat for a cold beer on a warm day. Don't be too quick to fish for a white wine to pair with the 1978 "Jaws" parody, "Piranha." The Roger Corman production, directed by TFH chief guru Joe Dante will probably require something with a little more bite. While "Jaws" had only one fish - okay, it was a pretty big fish - "Piranha" has a whole school of the fanged demons chewing up the scenery, and anything else into which they can sink their teeth. A Piranha attack is something which has fascinated me all my life, and apparently Dante was similarly taken with the idea of a bunch of fish picking a carcass clean. You have to love the script's plan to kill the piranhas by opening up the waste tank at a smelting plant and prevent them from making it into the open water of the ocean. It may be the only time in movie history that industrial waste was penned as the good guy. Did the plan go awry and allow the killers to spawn a sequel? Does a fish have teeth? Considering the tip of the hat to "Jaws" - and the dearth of piranha-themed wine on the market - we will look to another dangerous denizen of the deep for the wine to pair with "Piranha." Although Hello Vino says you should try Pinot Noir with shark, you may want to check with The Shark himself. Golfer Greg Norman has estates in California and Australia, from which some killer wines are produced. You can pair any of them with "Piranha" at prices that won't leave you feeling like they put the bite on you. Steele Wines Catfish Zinfandel - Recommended for Cioppino, which may well have some piranha in it. Cool Fish Wines - Whites are the specialty of this Napa producer, although pairing with piranha would suggest a red with toothy tannins. Big Fish Wines - A San Francisco-based winery which sources grapes from Santa Barbara County, Monterey and Dry Creek Valley. FishEye Winery - This South Eastern Australia winery promises wine that jumps out of your glass, which sounds as messy as the piranhas' victims. This wine contains fish - Personally, I'd rather hear "This fish contains wine." Piranha attack at the Smithsonian - Maybe I'm the wrong person to be asking this, but, who sits around thinking up this stuff? Incuded here because of the reference to "expensive Pinot Noired wine." Family Winemakers of California is an organization devoted to giving a voice to small wineries who often don’t have the means to hire big PR firms and woo legislators on their own. The group has sponsored legislation and litigation intended to give small wine producers the ability to compete in the marketplace. 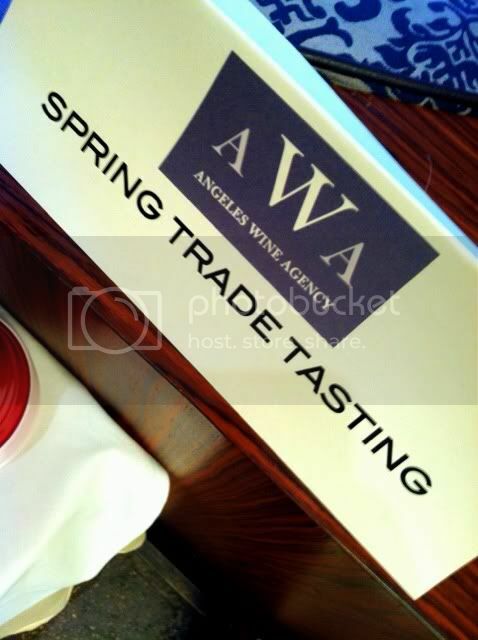 They also sponsor three tasting events each year - in San Diego, Pasadena and San Francisco. I attended the Pasadena event on March 13, 2012. As you can see in photo, it was a well-attended event. I was hoping to work the "family" angle of this event, and that worked out fairly well, as several nice stories of families working together came forth during the tasting. Cheryl Emmolo carries on the family wine legacy with sons and wine makers Charlie and Joey Wagner working wonders with fruit from her father's Rutherford vineyard. The small, Napa Valley winery impresses with their '10 Sauvignon Blanc, fermented in concrete, not steel. It's fruity with a nice, juicy palate. The Emmolo '08 Merlot displays outstanding notes of cocoa. 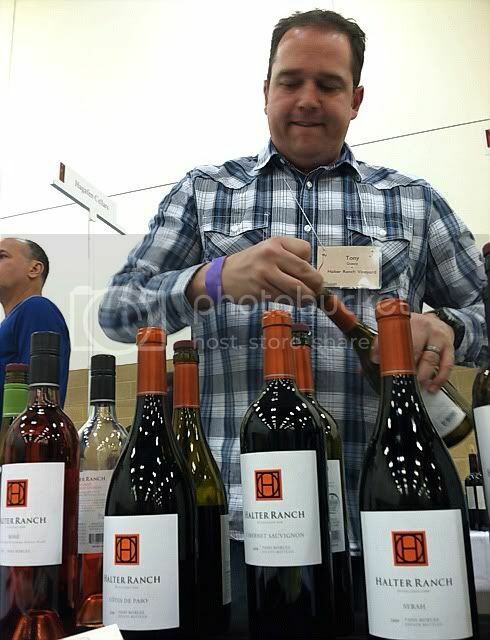 Tony Quealy (right) poured the Halter Ranch wines. This Paso Robles west side winery utilizes the Picpoul Blanc grape in several of their wines. Quealy explained, "We have found it grows quite well on our property." They also like to mix it up a bit in their blends. Quealy offered at one point that a particular wine had "only five varieties" in it. The Halter Ranch '11 Cotes de Paso Blanc is a blend of Grenache Blanc, Marsanne, Roussanne, Picpoul Blanc and Viognier. It's a smooth drinker with nuts and citrus leading the way. Their '11 Rosé has Grenache, Syrah and Mourvédre joined by Picpoul Blanc for a dry, earthy pinkie. Their '08 Cabernet Sauvignon features all five Bordeaux varities and shows off ripe fruit with an earthy edge. 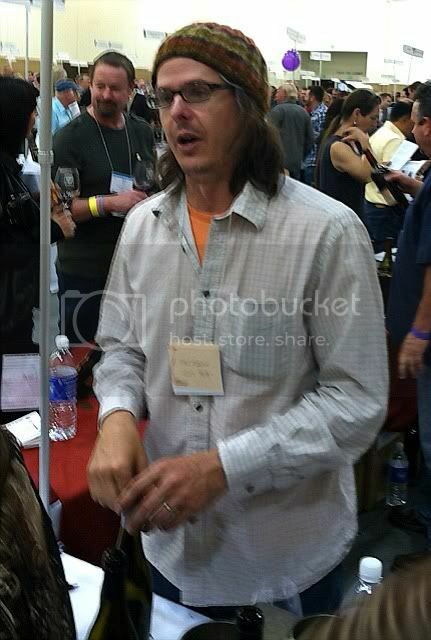 Kevin Sass is the Halter Ranch winemaker. He spent a decade at Justin Winery. Paso Robles producer Edward Sellers is located in the Templeton Gap, cooled by Pacific breezes channeled through the mountains. Winemaker Jeremy Weintraub did a fantastic job with the '07 Cognito, a blend of Mourvédre, Zinfandel, Syrah and Grenache. It shows big new-world fruit with an old-world finish. Sonoma County's Fog Crest Vineyard, in the Russian River Valley, poured a pair of Chardonnays and a pair of Pinot Noirs. The '09 Chardonnays offered a nice and easy touch of oak on one hand, and a steel-fermented fruit expression and acidity on the other. The '10 Pinot taken from several vineyards bears notes of cocoa, while the Estate Pinot has hints of eucalyptus. 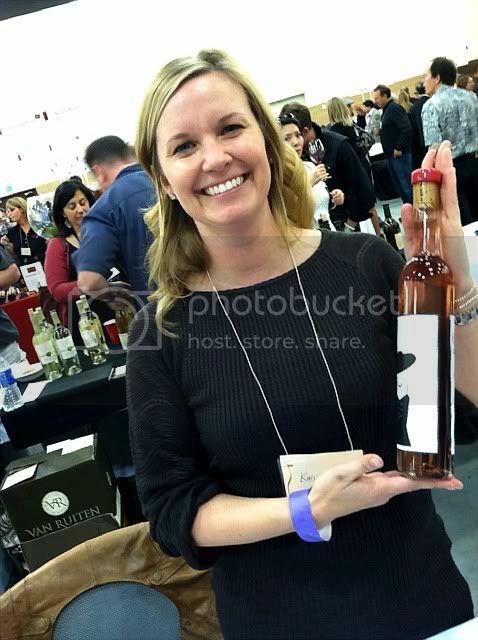 Bennett Valley's Argot Wine was represented by proprietor Karissa Kruse, (left) who poured their delightful '11 Rosé. It's dry and fresh, perfect for the coming warm weather. Argot's '11 White Blend of Roussanne and Chardonnay spent 10 months in the barrel and has a nice crème brulée feel with a nutty finish. Their '08 Syrah was in all new French oak for 30 months, but doesn't seem overoaked at all. Kruse borrowed a phrase from winemaker Justin Harmon: "You can't over-oak a wine. You can under-fruit it." Hidden Ridge Vineyard is a high-elevation vineyard on the west side of Spring Mountain in Sonoma County. Their '06 and '07 Cabernet Sauvignon are both very dark and concentrated. Temecula's Monte De Oro Winery has four vineyards covering 72 acres of Temecula Valley soil. Their wines have a very interesting aroma profile across the board, even the dessert wine. It's a sort of a chalky, rocky note which I find quite intriguing. 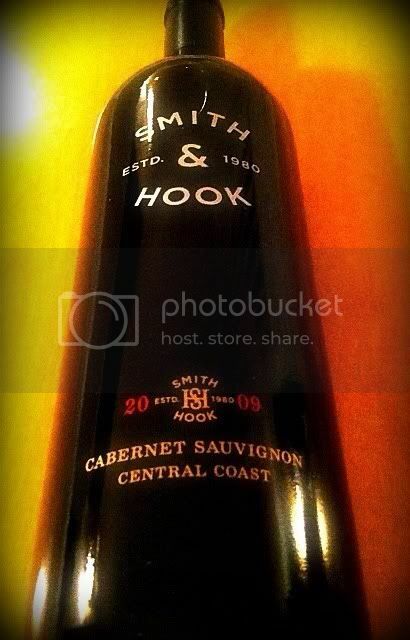 Their '05 Synergy is a blend of Syrah, Merlot, Cabernet Sauvignon, Cabernet Franc and Zinfandel. It's a nice effort which shows off the different aspects of the various varieties. Monte De Oro's '10 Zinfandel is one of the smoothest Zins I've had. The dessert wine - Legato - is a Zinfandel and Cinsault mix. Anomaly Vineyards rests at the foot of Napa Valley's Mayacamas Mountains, in St. Helena. Their '08 Cab also features Cabernet Franc and Petit Verdot, and shows big, dark fruit. Clavo Cellars winemaker Neil Roberts (right) showed off his '08 Desperado Paso RoblesPaso Zinfandel, brimming with earth and chocolate. The Ancient Peaks table had a prominently placed piece of oyster shell on the table, exhibiting the source of the amazing terroir of their Margarita Vineyard. The '10 Sauvignon Blanc is fruity and angularwith some great citrus notes. The seabed soil really shines through. Their '10 Cabernet is oaked for 15 months. It's a cooler vintage and shows bright acidity. The Conway Family calls Arroyo Grande home, and they really are a family affair. Chris and Ann Conway and their five kids share the ownership of the winery and estate vineyards. Winemaker Jonathan Médard outdid himself with the '08 Rancho Arroyo Grande Estate Syrah - an incredibly dark and amazingly intense wine. 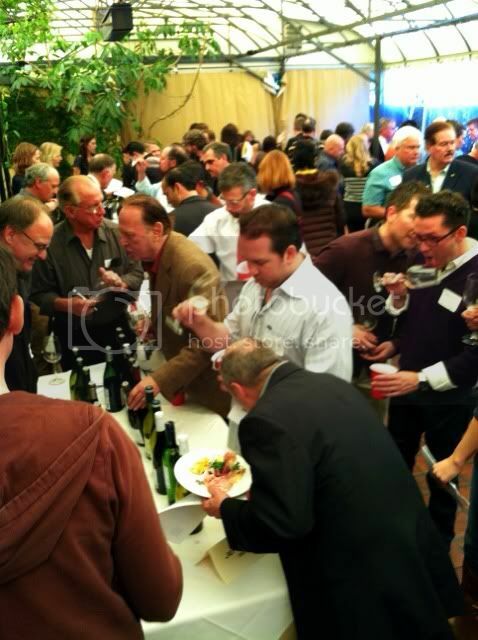 Corte Riva Vineyards in St. Helena made good on the family aspect of the event. Richie Rivera (left) represented the wines of his father, Romel Rivera, and his uncle, Lawrence Cortez. The pair came to America from the Phillipines in the 1970s and have been involved in the wine business since then. The '10 Rosé of Merlot has great fruit and acidity, while the Cabernet Franc shows great tannic structure along with a zippy acidity. The Cortez 78 Firepit Blend is an excellent second label effort for the family. Rivera said it shows "the Merlot on the nose, the Zin on the mid-palate and the kick of the Petite Sirah on the finish." Beckman Vineyards poured a great '10 Le Bec Blanc, a blend of Marsanne, Roussanne, Grenache Blanc and Viognier. American oak helps give great spices to this one. Beckman's '09 Grenache - from their Purisima Mountain vineyard - is just plain luscious on the mid-palate and very dry on the finish. Time ran short and I didn't get to taste much from Santa Barbara County's Tantara Winery, but Ernie Vandegrift saw my "Now And Zin" name tag and said, "Here - try this. It's kinda Zin-like." It was the '09 Tantara Syrah, big and powerful. Clos Pepe's winemaker Wes Hagen (right) was letting his freak flag fly, as he likes to say. He was preaching his Pinots to the choir, as it were. He never fails to draw a crowd at tasting events with his presentation, which always makes me think of a tree-stump orator with the flash and sizzle to keep a crowd enthralled. 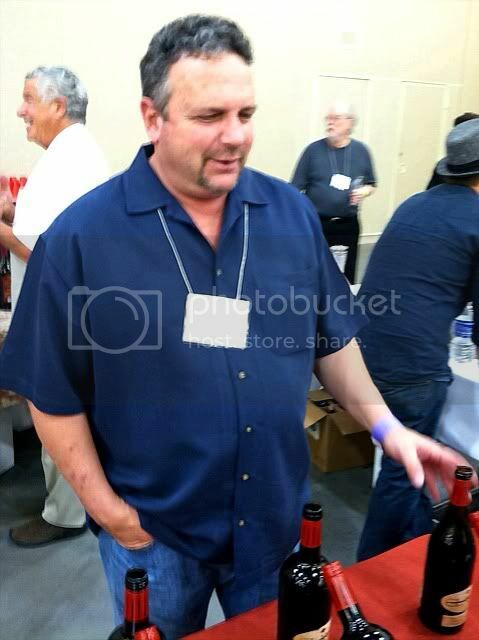 Tercero's Larry Shaffer had the beakers out, but, alas, his table full of Rhones was another one I missed due to time constraints. Here's the press release about a new restaurant for Paso Robles set to open on March 15, 2012. Locally-grown food ingredients and local wine and beer are promised. Paso Robles, CA — Firestone Walker Brewing Company is advancing its commitment to local flavor with the upcoming official opening of The Taproom restaurant in Paso Robles on Thursday, March 15. Located adjacent to the brewery at 1400 Ramada Drive, The Taproom offers a full-service dinner menu with a focus on locally grown ingredients and wines as well as a broad selection of fresh-brewed Firestone Walker beers. The restaurant and accompanying bar are open daily from 5 p.m. to 9 p.m. The Taproom menu blends traditional California cuisine with other influences to create what co-proprietor David Walker calls “brewhouse bistro cooking.” Signature dishes include Grilled Pork Chops brined and prepared with a DBA beer mustard demi-glaze, and served with sweet potato fries and sautéed broccolini; Beto’s Fish Tacos made with crispy halibut, avocado and paprika lime dressing, and served with jicama fruit salad; a Taproom Burger with Kobe beef topped with cheddar, lettuce, tomato, caramelized onions and chipotle mayo on a potato bun; and the 805 Salad made with fresh, locally sourced organic greens tossed with shallot thyme vinaigrette and topped with goat cheese and crostini. The menu also includes five different wood-oven pizzas, including a steak and cheddar pizza and portabella mushroom pizza. Themed specials will be offered each night of the week as well, such as pasta specials on Mondays and steak specials on Saturdays. Featured local ingredient providers include Windrose Farm, Thomas Hill Organics, Olea Farm olive oil and Joebella Coffee Roasters. Ingredients from the brewing process will also be incorporated into select dishes, such as spent grains used to make pizza crusts, and “beer honey” made with sweet beer from the early stages of fermentation. Designed and built by local craftsmen, The Taproom features a spacious modern ambiance that echoes the brewery environment, including brushed steel, corrugated metal, rustic wood and copper appointments. Design touches include a mini “bottling line” with bottled beers circling over the bar; a deconstructed brewing tank that serves as the entrance to the restrooms, with the floor of the tank serving as the host station; and the original Firestone Union oak barrel brewing system mounted on the far wall. Seating includes booths and tables, as well as long-table seating, whereby patrons sit side-by-side for a community dining experience. A patio offers outdoor dining, and the bar features numerous Firestone Walker beers, including ongoing special releases. The restaurant is staffed by 64 local employees. Maximum inside seating for the main dining room and bar is 234 patrons. “Whether you are a visitor or a local, we want the dining experience to have a real neighborhood feel, with high-quality but friendly food that goes great with our beers and wines,” Giesler said. The Taproom accepts reservations at (805) 225-5911 ext. 800. For more information, visit Firestone Beer. I'm told the wines featured at The Taproom will include selections from Tablas Creek, Curtis, Saxum, Terry Hoage, Linne Colado, Thacher, Andrew Murray, Cass, L'Aventure, Jarhead, Hearst Ranch, Storm, Brochelle and Halter Ranch. Pali Wine Company specializes in making Pinot Noir and Chardonnay in their Lompoc, California facility. Their Pinots are made from grapes grown in what their website refers to as “top locations” - California’s Sonoma Coast, Sta. Rita Hills AVAs and Oregon’s Willamette Valley. Founders Tim Perr and Scott Knight hail from the coastal SoCal community of Pacific Palisades, which is why their wines are named after neighborhoods there. Pali plans to increase their production this year, and open a tasting room in downtown Santa Barbara, too. They were kind enough to provide some samples for the purpose of this article. I wrote about the Pali Riviera Pinot recently. It was a Sonoma Coast product, while the Huntington is made from Santa Barbara County grapes. 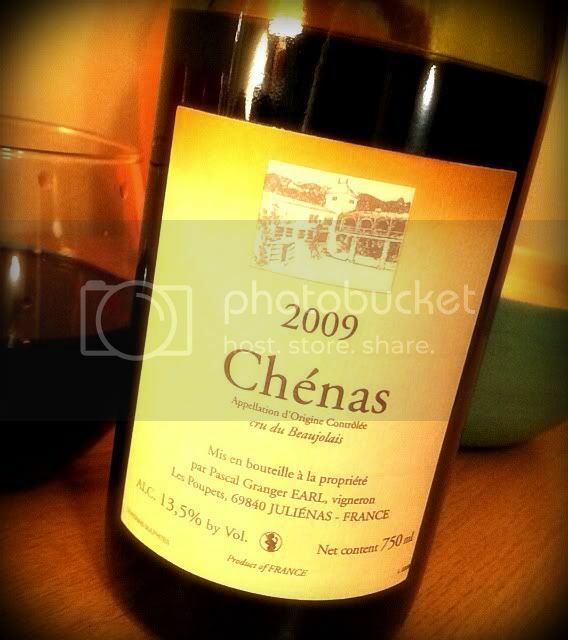 The wine is aged for ten months in 30% new French oak barrels. It sells for $21 and sports a 14.6% alcohol content. The Huntington's dark purple color is a precursor to a nose that is amazing. There's cassis up front, and further sniffing reveals aromas of chocolate syrup, coffee and spiced tea in a remarkably fresh and vibrant setting. Smelling this wine is really a treat. The palate shows ripe, dark fruit. Black cherry and dark plums leap right out, with faint coffee notes and a finish of black cherry cola which hangs around quite a while. The tannins are nice and firm - it's not a shy wine, and it may not be for Pinot purists. There's a Syrah-like quality to it - that's how big and rich the Huntington drinks. 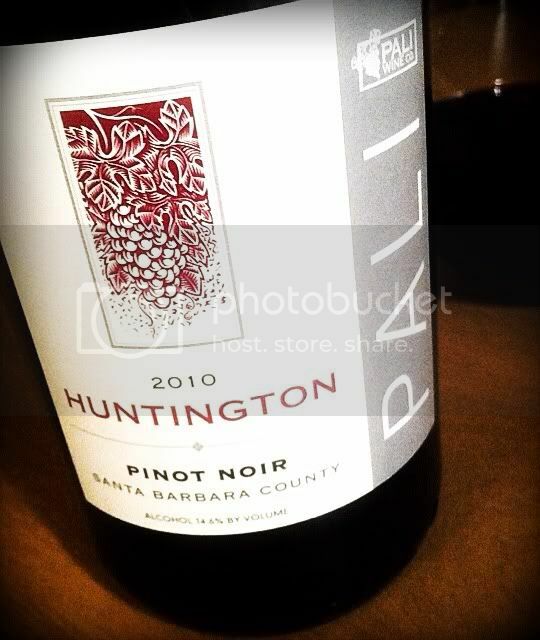 "The 2010 Huntington (and all Pali Pinots for that matter) is 100% Pinot Noir. 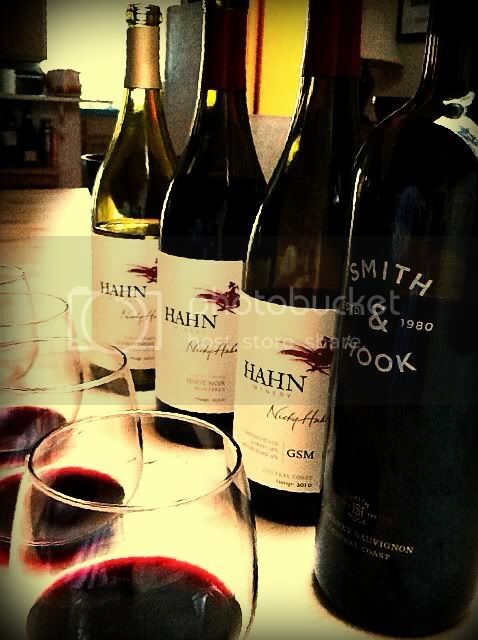 We have never blended any other varietals into any of our pinots. "Most of our 2010 pinots are very big and fruit forward - it was the late heat at the end of the growing season that produced this style. The 2010 summer/growing season was very cool, with very little significant heat until late September and early October when we saw two big heat waves. In most cases this caused the grapes to ripen (almost to the point of being over ripe) very rapidly. This resulted in wines that are big, jammy and very fruity. I can see why you might think there is some syrah in this wine - but truly it is 100% pinot noir from vineyards in Santa Maria Valley and Sta Rita Hills. 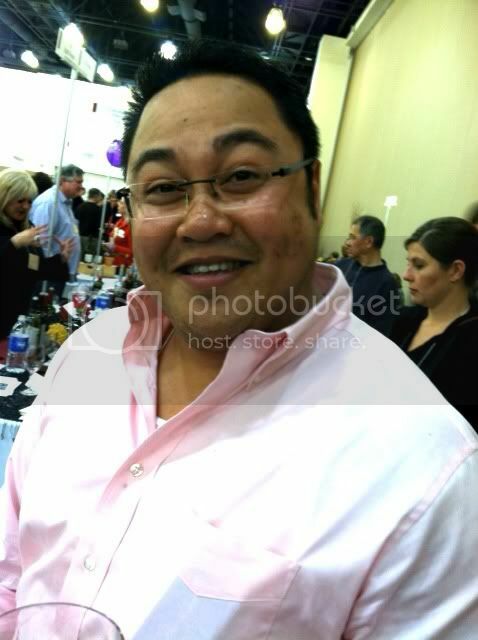 "And if you think that wine is big, you should try our 2010 Summit - 100% Sta Rita Hills pinot noir - it is massive!" The California Central Coast wine region has a hashtag day coming up! If you use Twitter in order to converse with other wine lovers - or #winelovers - you have no doubt seen entries utilizing the hashtag - # - to raise the profile of a specific grape variety on its special day. Now get ready for #CCWineDay. 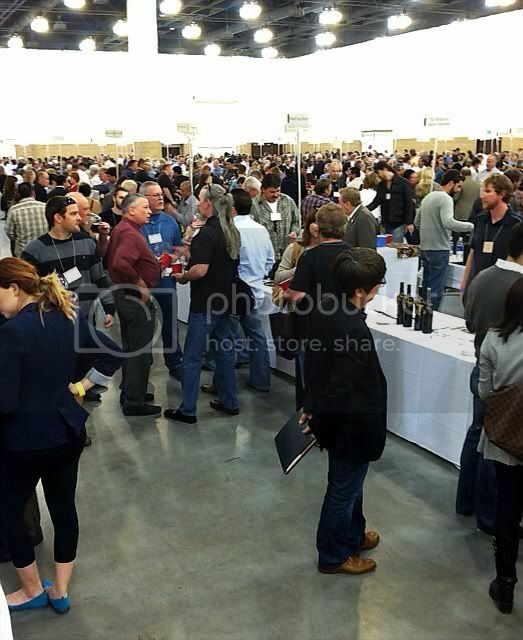 That's the hashtag designation to use on March 15, 2012 as you tweet up your favorite Central Coast wine. Presumably, you may also toot the horn of your favorite Central Coast winery, vineyard, wine bar or wine store. Whatever helps make the Central Coast wine region worthy of recognition is fair game. It's a huge appellation, stretching from Southern California to Monterey Bay, so there should be no shortage of worthy hashtag recipients. The whole day is expected to feature plenty of Twitter activity in the #CCWineDay hashtag, but the biggest concentration is expected between 5:00 and 7:30 p.m. on March 15th. See the EventBrite page for a partial listing of those participating, and if you'd like more information on getting involved, email mark@HahnFamilyWines.com. 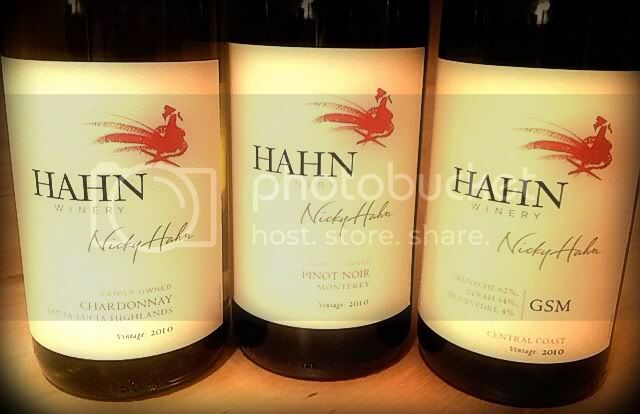 Hahn Family Wines has been kind enough to provide some samples to Now And Zin which I will be tasting and tweeting about on Central Coast Wine Day. When I was in college - way back when - the student center had a room where a different video each week was piped in and played continuously. I would plop down between classes - when we weren't drinking something horrible at the school newspaper office - and catch fifteen minutes or so of whatever they were showing. By the end of the week I had probably seen the whole feature - in bits and pieces out of sequence. I saw "Lemmings" that way, and "Groove Tube." I also saw the 1957 horror classic "I Was A Teenage Werewolf" that way, and it was a delightful week. It may have been the movie, or it may have been the horrible stuff we were drinking at the newspaper. After so much time, I'll charitably attribute it to the film. The movie stars Michael Landon, before his "Bonanza" days and waaaay before his "Little House on the Prairie" days. It also stars Whit Bissell, a great character actor who was in so many films of the 1950s you'd think he came with the cameras. For no apparent reason - or maybe because of the horrible stuff - Whit became one of my favorites, and I watched anything in which he appeared. In "Teenage Werewolf," Landon plays the troubled young man while Bissell plays the troubled older man. That's a lot of trouble there, and that starts with T and that rhymes with C and that stands for cool, which is how I rate this film. What else but Werewolf Cabernet Sauvignon for this film? The website exclaims the wine is "notable for its dark red color." Well, I would hope so. They also make a Pinot Grigio, which is notable for its lack of red color. At seven dollars per bottle, you sometimes have to take whatever color you get. You just hope it's not too horrible. How wine can turn you into a werewolf - "A bottle a night, two a night on weekends" ?? Werewolf tendencies could be the least of your problems. Wolff Vineyards in Edna Valley - Beautiful wine country, just outside San Luis Obispo and not a werewolf in sight. Stone Wolf Vineyards in Oregon's Willamette Valley - The stone wolf guards the vineyards. Finally, a good guy wolf! Grey Wolf Cellars in Paso Robles - On the label: "Life is too short to drink bad wine." Wolf Mountain Vineyards & Winery in Georgia - They are in the foothills of the southern Appalachian Mountains.